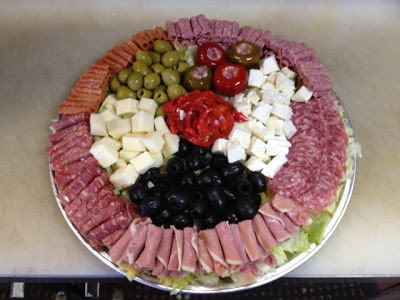 Antipasto Platter - This Italian Appetizer is Great for Parties! Super Bowl time is coming. What could be better than Italian appetizers. The next few posts will be ideas for a Super Bowl party. What can be better for any Super Bowl party then Antipasto? Antipasto is an Italian word that translates to “Before Pasta”, but I translate it to Before Dinner. A more common term is hors d'oeuvres, in French, or appetizers. Antipasto Platter! Excellent for your Super Bowl Party. Antipasto is served at most Italian family get togethers! Many cultures have similar style appetizers. You can choose whatever ingredients you desire… All of your favorites. What I present here is guidelines. Please feel free to adapt any way you wish. I am not going to specify amounts of each item. Use your best judgment, based off of the amount of people you wish to feed. Wash vegetables well and allow them to dry completely. Cover a large serving platter with a layer of Lettuce Leaves. Place a bowl in the middle and place the Marinated Mushrooms, Artichokes Hearts, Roasted Peppers and Olives, separated from each other in the bowl. Around the bowl, place the cheeses, each in their own section. Around the cheeses, place the sliced meats, each in their own section. I roll all of the meats. Place broccoli, grape tomatoes and any other veggies each in their own section. Chop up the lettuce and place in a large serving bowl next to the platter. Some folks drizzle a little dressing all over everything on the platter. I prefer to place it on the side so that guests can control how much dressing is used…. Use your best judgment. Stand back and admire the wonderful platter you created. There you have it, a really nice antipasto platter that you made yourself. Adapt it any way you want…. Do you like Roast Beef? Do you like hot peppers? No problem! This is YOUR antipasto! Any way you want it, that’s the way to make it. I hope you enjoyed this Antipasto platter. Please check back for more italian appetizers recipes! I will be posting several Super Bowl friendly Italian specialties in the very near future. I hope these authentic Italian Recipes make your Super Bowl part a night to remember!